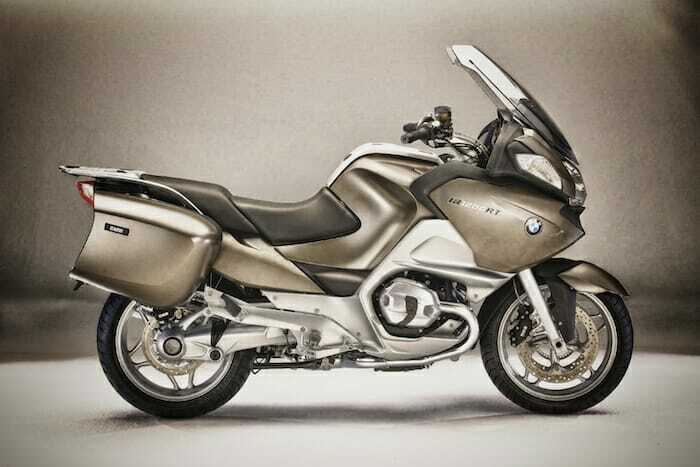 Interested in a US BMW 1200RT Rental -the BMW 1200RT is a touring bike packed with technology and personality. BMW has a reputation for pushing the boundaries of technology on their motorcycles. The 1200 RT has alternative front suspension, ABS, shaft drive, and Can-bus electronics, but the powerplant is an air-cooled Boxer design. All this great technology works to provide better performance and make the rider safer, and that punchy Boxer motor is a joy. Details like heated handgrips and an electronically adjustable windshield really come in handy in foul weather, and the 1200RT has superb weather protection overall. Jim used to own a 1200RT, and rode the bike through freezing New York winters. The RT has a power plug in the dash so if you’ve got a heated vest (and the proper connector) you can be toasty warm in very low temperatures. Pillion comfort is excellent, and the detachable sidebags are superb – no need to unpack your bike, just disconnect the bags from the bike, open the handles and carry them like suitcases up to your hotel room. Even the headlight on the 1200RT is superior, lighting up the whole road even on the low beam. The standard Harley lamps are anemic by comparison. And of course, the lighter weight, heartier horsepower and sports suspension all conspire to deliver a motorcycle capable of performance vastly superior to really any Harley. If you’re touring n America, sometimes a Harley is the right tool for the job because you relax, enjoy the scenery and the vibe(s). But for some motorcyclists, performance is a necessary element of enjoyment when they ride. Which kind of rider are you? Note the BMW 1200RT is only available at certain EagleRider locations, and is considered a premium rental, therefore slightly higher priced.